The simple way to describe how water softeners work is to look back through the line of history. In the early 1900′s water softeners were tall steel vessels filled with a natural mineral called Zeolite with the specific property of softening the water. Water softening is sometimes referred as Base Exchange. Water would enter as hard water at the top of the vessel and pass down through the mineral being fed back into the property as softened water. This process continues until the water softener becomes exhausted, at this point salt water needs to be added. The salt washes away the hardness minerals that had previously been collected by the water softener. The softening process can now continue to feed the household with soft water until the next time it is cleaned with salt water. How water softeners work – this illustration shows a simple overview. 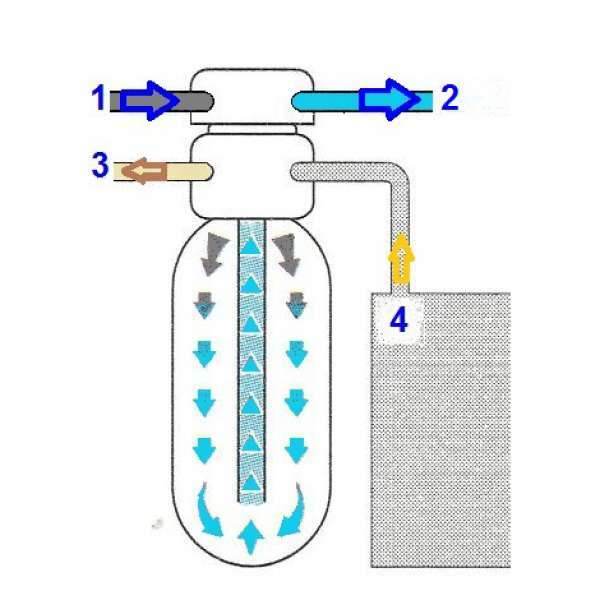 How water softeners work illustration shows hard water entering the control valve through port 1. It then passes into the more modern and efficient mineral bed where the hardness minerals are captured. In nature we cannot remove something without upsetting an equilibrium. So the water softener mineral collects the Calcium (or Magnesium) ions and exchanges it for Sodium ions. Water leaves the water softener as softened water through port 2, to supply you with fantastic soft water. Modern water softeners measure the volume of water that is softened and will therefore automatically know when it should clean itself. In the cleaning process (more often referred to as the recharge or regeneration cycle) the water softener will draw salt water from the brine tank through port 4, and inject the brine into the water softening vessel. As the salt passes through the mineral the above process of ion exchange is reversed, the calcium ions now being washed to a drain through port 3 and sodium ions left in the mineral vessel. The water softener is now ready to pass soft water once again to you household. This is simply how water softeners work. Modern water softeners work in a similar way to the early types of water softeners. However, in a more efficient and sophisticated way. Modern water softeners are much more compact and have automated cleaning cycles. There are many different types of water softeners available in the market place, manual water softener, semi-automatic water softener, volume controlled water softener, electric water softener, non-electric water softener, tablet salt water softener, granular salt water softener, block salt water softener…. etc. The easiest way is to allow us discuss with you the choices and your options. Please contact us for a survey, or telephone 0800 068 1857.